Bandwidth Hogs: What's Clogging Up Campus Networks? Tablets, mobile phones or traditional computers: Which are the biggest bandwidth hogs on campus? According to a new report from the Association for College and University Technology Advancement (ACUTA) and the Association of Colleges and University Housing Officers-International (ACUHO-I), the answer for most campuses is traditional computers. The study, “2016 State of ResNet,” surveyed IT leaders, housing officers and business officers at more than 360 U.S. colleges and universities about their residential network practices and policies. Survey results indicated that traditional computers (desktops and laptops) narrowly edged out tablets and phones as devices forecast to consume the most bandwidth over the next couple years. Participants in the study were asked to rank network devices by the severity of bandwidth consumption on a scale of 1 (little bandwidth consumption) to 10 (very high bandwidth consumption). A majority, 58.6 percent, ranked traditional computers in the 8-to-10 range. That’s down substantially from 76.5 percent last year, though this is the second year in a row that traditional systems have taken the lead in this category. Right behind desktops and laptops came tablets, which included both iPads and Android devices. A substantial 57.7 percent ranked those in the 8-to-10 range. Smartphones came in third, with 55.2 percent ranking those from 8 to 10 in bandwidth consumption severity. 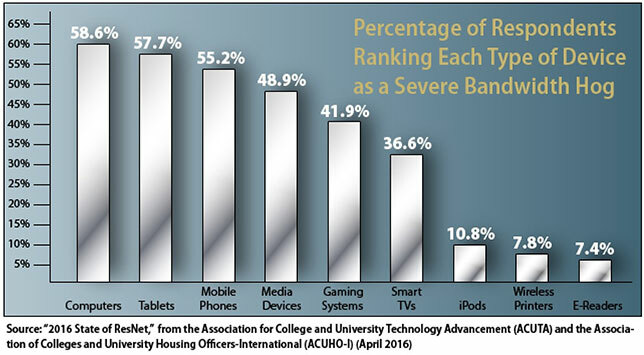 Beyond those categories, campus IT pros also considered media devices like Roku, Apple TV and others to be fairly severe bandwidth hogs, with 48.9 percent putting them in the 8-to-10 category. Gaming systems rounded out the top 5 at 41.9 percent. On the lower end of the scale were smart TVs (ranked as severe bandwidth hogs by 36.6 percent of respondents), iPods (10.8 percent), wireless printers (7.8 percent) and e-readers (7.4 percent). The complete report, which is being formally released next week to coincide with the 2016 ACUTA Conference and Exhibition in San Diego, CA, can be accessed on ACUTA’s site.